Incredibly, your baby is now over a kilo in weight and measures almost 40cm in length! He or she is still hiccupping, coughing and taking practice breaths, and now they are able to blink their eyes. It is also thought that by this stage in a baby's development they dream while they are asleep. Ever more alert when awake, your baby will be able to notice and turn their attention (and head) towards a bright light seen through the uterus wall. If you are keen to interact with your little one then spend time talking or reading to the baby. Although they can't see you yet, they will benefit from becoming familiar with both yours and your partner's voice. You may be experiencing swollen hands, feet, wrists and ankles. While you have no doubt heard a lot of talk about swelling being a sign of the potentially serious condition pre-eclampsia, swelling is also experienced in a great number of perfectly healthy pregnancies. Always let your midwife know about any swelling that you are having, especially if it occurs in the hands or face and comes on suddenly. They will test for high blood pressure and urine in your protein, both of which are signs of pre-eclampsia. Generally, swelling (particularly in the lower areas of your body such as the ankles and feet) is a normal side effect of pregnancy. It can be uncomfortable or frustrating if your shoes don't fit, but it is not usually anything to worry about. There are a number of things that you can do to alleviate the problem. Make sure that you don't spend long periods of time either standing or sitting still, but when you do have to sit down (quite likely for most people at work) try to make sure that your feet are elevated. Make sure that you are still continuing to exercise unless your GP has advised otherwise as it will help to keep your blood flowing. Water-based exercises such as swimming or water aerobics are even better as the water pressure helps to push the fluid back into your veins, where it will then make its way to your kidneys so that you can excrete it. And although it might not seem logical, drinking more water will actually help to rid of you of that extra water retained, so make sure that you are staying hydrated. You should have another routine antenatal appointment this week. 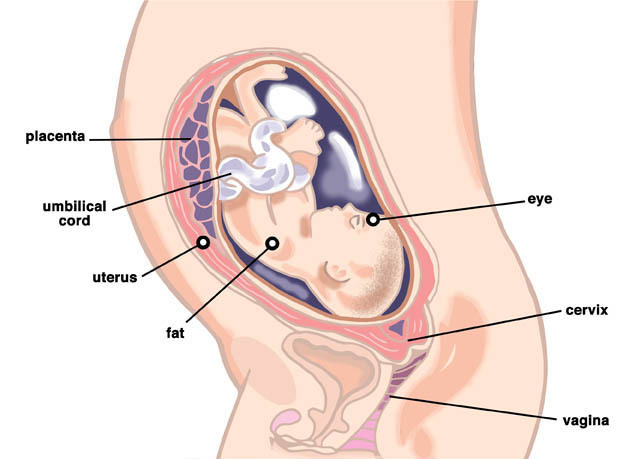 The midwife will check the size of your abdomen which gives an indication of the baby's growth. If they have any concern about this, they will refer you for another ultrasound scan to ensure that everything is on track. They will ask you whether you have had any swelling of the hands or face, and also check your blood pressure and urine. These are all to detect any signs of pre-eclampsia. Pre-eclampsia is a condition common towards the end of your pregnancy and if left untreated, it can develop into eclampsia, a serious condition which causes seizures. Even if this doesn't occur, pre-eclampsia itself can be responsible for a number of pregnancy complications such as premature delivery or intrauterine growth restriction. The midwife will also do further blood tests at this appointment, the results of which will be given to you at your next appointment (at around 31 weeks). This blood test will check for conditions such as anaemia. Earlier in your pregnancy you will have had a test to establish your blood group, and whether your rhesus D (RhD) status was positive or negative. If you are RhD-negative then at 28 weeks you will be offered an anti-D injection to prevent future babies from developing problems. Page generated in 1.3048 seconds.